Buy tickets now for our 8th Annual Bay Street Bash. This year's primary recipient is the Givens Senior Center. Enjoy Blackjack, Craps and Roulette with professional dealers. 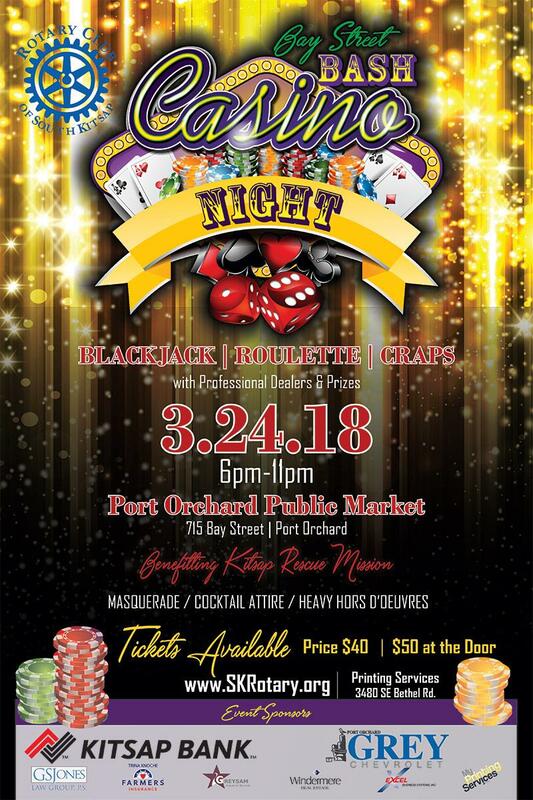 Enjoy food, photo booth and face painting all while raising money for your community. Marvel over our delightful use of alliteration as you purchase your tickets and don't forget to tell your friends. Download the pdf here to print one out or email to arrange to have one delivered. Thanks for helping us advertise and don't forget to buy your tickets. Buy your tickets now for this year's Wine with Wags. Lots of great new wineries this year and heavy hors d oeuvres. A silent auction too. For more info go to our Facebook page or buy tickets now. Tickets now available. Online or from your favorite neighborhood Rotarian. Get more information or be involved in the conversation at the our Facebook event page . BUY YOUR TICKETS here. Download the high res flyer here. It's that time of year again. Time to come out of hibernation and start your spring cleaning. And that means it is time for Kitsap County's second biggest garage sale. Hosted by the Bremerton, East Bremerton, Mason County and South Kitsap Rotary Clubs, RAGS is an excellent way to get rid of some of that salable clutter around your house, get a tax deduction and raise money for some great causes. Drop off locations will be available up to April 8th and pickup from your home or office will be available from the April 9th-13th. CALL 360-917-1240 For more information or to schedule your pickup. Etta Turner was an individual – unconventional, inquisitive, sarcastic and caring. She loved humanity, embracing everyone. She also loved life, living it to the fullest. In 2002, her adventurous spirit led her to the South Kitsap Rotary Exchange program and on to Bolivia. At sixteen, her life tragically ended on a bus trip into the mountains. From her death, however, arose a wonderful organization called Etta Projects that helps children and families. Although Etta touched souls on three continents, she is most dearly missed here, by the Port Orchard Community she called home. 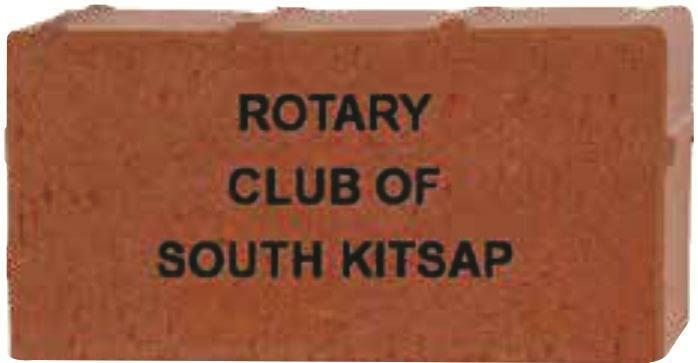 To honor Etta's memory, the South Kitsap Rotary club constructed a park on Bay Street in 2004. Half of the proceeds from the bricks being sold will be used for making needed electrical, structural, and landscaping updates. The remaining proceeds will be donated to Etta Projects in Bolivia, to be used for a humanitarian project consisting of vision, dental, and clean water.